A high powered delegation from the Durban University of Technology (DUT) in South Africa visited the Midlands State University on the 17th of October 2018, in a bid to identify areas of cooperation that will see the two academic institutions establishing a partnership. The delegation was hosted by the University’s International Relations Office at the Gweru Main Campus. Under the envisaged partnership, the two institutions are set to introduce student exchange programmes, while Midlands State University lecturers will also get an opportunity to supervise Durban University of Technology postgraduate students. 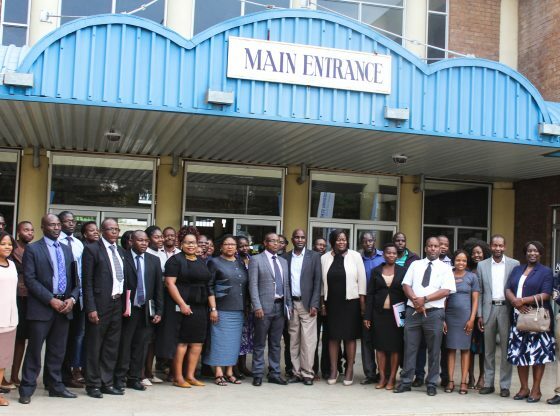 The visit also gave the South African institution an opportunity to assess the level of interest for its postgraduate studies among MSU members of staff and students. Speaking on the visit by DUT, the MSU Executive Dean of International Relations, Professor Andrew Manyawu, said the approach chosen by the Durban University of Technology was the first of its kind by a South African University and its advantage was that it would benefit both institutions. ‘We thought this is something that we can look into together, build on together going forward. They are here primarily to look for students, postgraduate students for the MTech, which is Masters and their DTech which is the PhD, and they are looking for supervisors. They spoke of core-supervision … so this is a wonderful opportunity for growth,” said Professor Manyawu. Faculty of Arts Research Coordinator with Durban University of Technology, Dr Maleshome Rapeane Mathonsi explained how DUT operates, what it`s students have achieved and the benefits that prospective students can stand to benefit from the institution. She said the university `s main agenda is decolonisation hence the need to look for Africans who understand the issue from an African perspective. ‘That is why we are looking for Zimbabwean students because we also want cross-pollination of ideas and skills so that Africans can do it themselves. So we are not looking for European supervisors at the moment but we would like to work with students and supervisors from Zimbabwe. Our understanding is that the Americans will not understand what our challenges are with issues of decolonisation,’ she explained. Durban University of Technology offers a wide range of programmes and just like the Midlands State University, it`s students have won several accolades at various national, regional and international competitions.